First I used Tim Holtz inks Fired Brick, Spiced Marmalade and Fossilized Amber to paint my canvas tag. 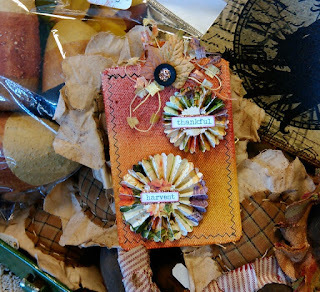 Then made the little rosettes with my Sizzix die cut and some Fall paper. 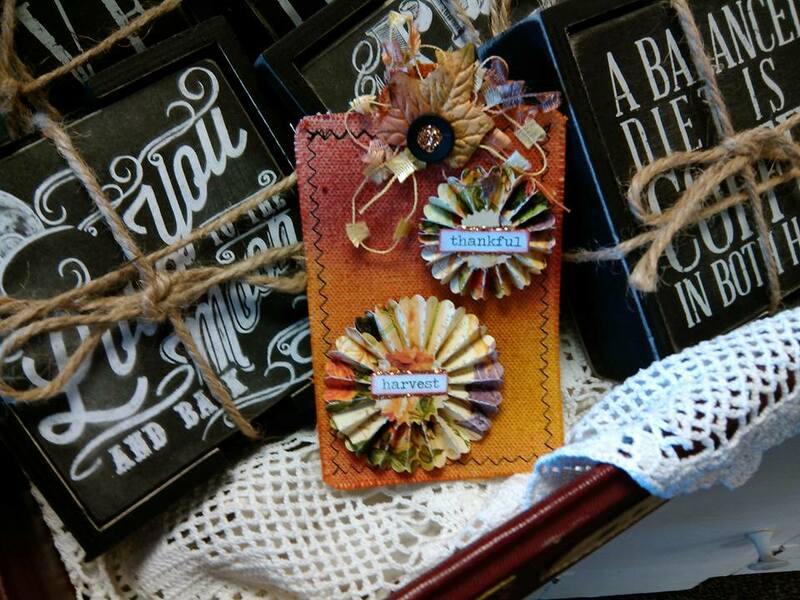 I used Tim Holtz Seasonal Small talk for the words on the rosettes. I found some Fall colored Trim, a leaf and a button for the top. I used Copper Stickles in the center of the button to give it a little sparkle and I outlined the words on the rosette with it also. I have all the products in the store to make these and I have the rosettes cut and packaged and ready to make. Come by and see what else we have going on... lots of classes for the Holidays. Check out the store Facebook page for more ideas and events coming up.